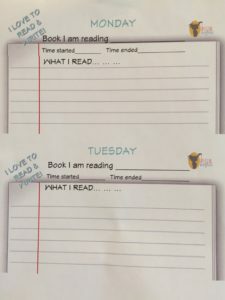 I have seen so many reading charts, but not very many reading & writing charts, so I decided to make one that has worked really well. My brother who is a school teacher just returned from a teaching conference, and they stressed the importance of not only daily reading, but daily writing. Depending on your child’s level, you could have them begin by writing one sentence. Encourage them in their writing, and try not to be too critical in there mistakes. They will catch on, on their own time. If you force the issue, they will fight you every step of the way. With this printable you can provide rewards if your kids do it everyday. Find out what works for your family and run with it. 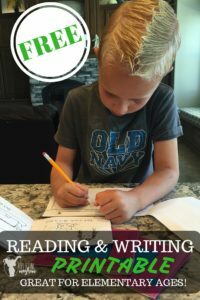 Change up the rewards so your kids are motivated to read and write. This last week I told my boys that if they read and write everyday, we get to go to the pool. If they wrote two extra sentences, then they get to buy something for a dollar at the snack shack! This printable has a half a page for everyday of the week except Sunday. I tell my boys they need to read & write 5 out of the 6 days. If they miss a day, they can always have one more day to still earn their reward. The great thing is that you can do what fits for your family! If you want to start doing 3 days a week, that is fabulous. I staple each boys packet together, and we keep them in one location so they don’t get lost! The older kids write a short summary about what they read, and my younger boys write or draw whatever they want. Its fun to see their little minds working! ENJOY READING YOUR KIDS IMAGINATION AT WORK! Eczema on Babies: What We did for my Infant’s Eczema That WORKED!